Sorry! is known as “The game of sweet revenge.” This may sound a little harsh, but we all know life isn’t always fair. What better way to teach your children how to deal with life’s little setbacks than with a board game that is a whole lot of fun to play? Players begin the game with all four of their colored pawns in their respective Start space. A deck of cards is shuffled and placed in the center of the board. The goal of Sorry! the board game is to be the first player to get all four of your colored pawns around the board and into your Home space. The five spaces leading up to your Home space are called the Safety Zone. Once a pawn is in your Safety Zone, it cannot be touched by another player for any reason, but you must draw a card allowing you to get that pawn into the Home space with an exact number of moves. Several things can help you get around the board faster. You can land on the Slide of another player, allowing you to move ahead four extra spaces; you can draw an 11 and switch places with an opponent who is closer to your Home space, or you could draw a Sorry! card, allowing you to remove a pawn from your Start space and send another player’s pawn back into their Start space. This is a crucial element of the game, getting ahead at the expense of an opponent. It’s also the key to the game’s competitive element and the sense of revenge. Any tantrums caused by Sorry! the board game are likely to originate from these cards! Be careful before you exclaim “Sorry!” too loudly… remember that what goes around, comes around. 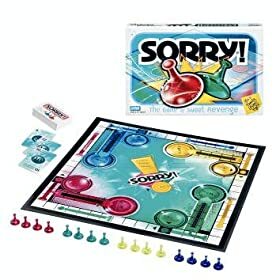 On their next turn, a player could be saying “Sorry!” to you. Sorry! is a board game that’s bright, simple and well-designed. It’s stood the test of time, which is always a good sign that current players will get a kick out of it, too. The game has a lot of rules to remember, so there will definitely be a learning curve for younger players. Strategic thinking is a big part of this game, so young children may need a little extra coaching to get the hang of it. Once the rules of the game have been mastered, it is a lot of fun to play and lasts long enough to enjoy, but not so long that you find yourself longing for the game to end. Adults won’t want to play too often, but it ranks well as a family game experience. A great choice as your child’s first complex board game. Sorry! the board game will give their brain a good workout and will provide many hours of fun. Tracy Alt is the owner, creator and editor of Tips to Organize Life, the website that provides shortcuts, tips and tricks to help you get things done faster and better. Tips to Organize Life focuses on all aspects of life, including organzing your home, cooking, entertaining, money management, children, communication, gardening, planning for emergencies and more. I am a big fan of this game. Since I was little this has always been my favorite game to play when we had guests. I have three brother and we always had a ball playing Sorry. sup need good price on the boardgame Sorry!